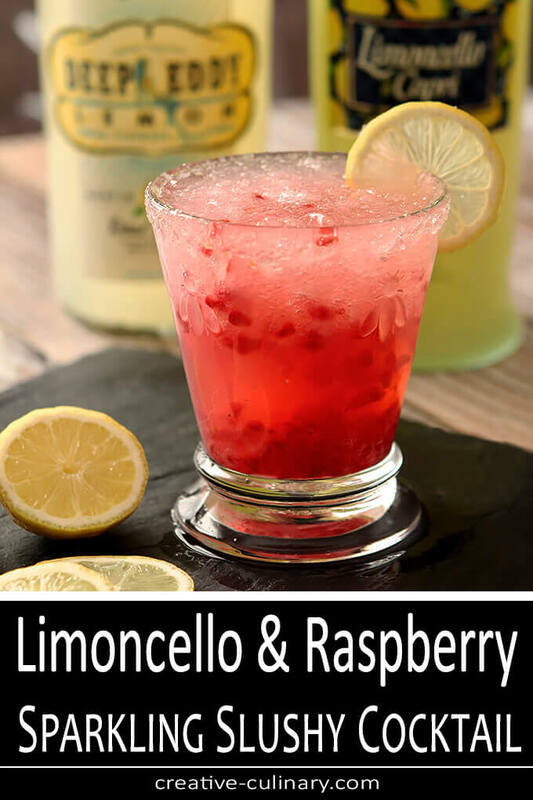 Perfect for warmer weather; this Limoncello and Raspberry Sparkling Slushy Cocktail is a wonderful combination that is sure to refresh. I admit it; I have way too many adult beverages in this house. My name is on a list and that list ultimately provides me with a lot of samples of booze. I love making cocktails and I’m not sure I could do what I love every week without the resources made available to me but the real truth is I could have even more. If I said ‘yes’ to every offer I would have to be building a shed out back. But I don’t; I’m picky and trust me, if you EVER see a post with Bubblegum Vodka then you know it’s time to shoot me. I have been privy to some great products that I’m certain I would not have been aware of otherwise and I’m lucky to have so many options when it comes to creating a cocktail. Sometimes there are days when product and circumstance come together and result in a cocktail that I just love. I seldom name my cocktails but if I were to be so inclined this would have to be The Pucker Up. It’s lemon, more lemon, raspberry, and then garnished with more lemon. And oh boy is it good! 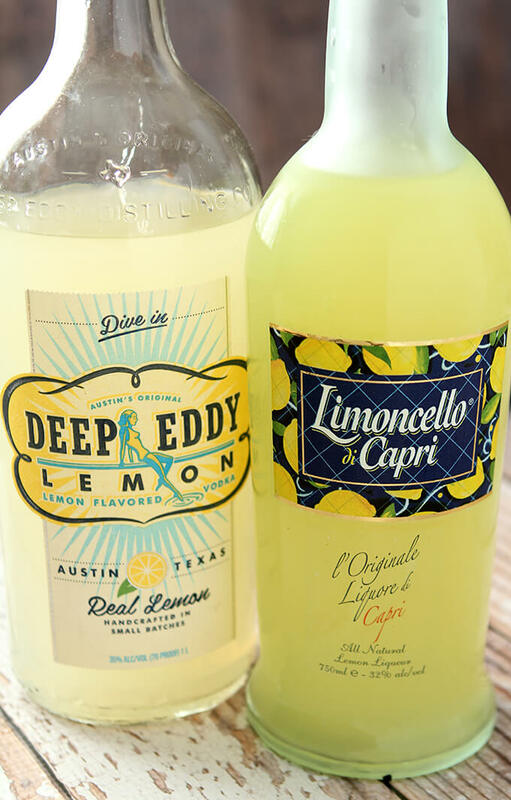 I love Deep Eddy Lemon Vodka which is distilled in Austin. Not typically a fan of flavored vodkas, this one arrived at my doorstep and interested me enough to try it because it is handcrafted in small batches and contains real lemon; you can even tell by the color of the product that there is actually lemon in it. Now that I’ve tried it I’m hooked and on the hunt for their Ruby Red Vodka with pink grapefruit juice. I’m not usually prone to drinking vodka straight up but this vodka with the taste of lemon ice cold from the freezer? I’m not that stubborn; my mind can be changed. I’ve been waiting for Denver to move out of the ice age into a bit warmer weather before considering what to make with it but whatever it was, it was going to be cold so I stuck it in the freezer. Perfect storage place for vodka; it’s like Russia in there! Combined with a bottle Limoncello di Capri I already had on hand in my freezer; the Limoncello and Raspberry Sparkling Slushy Cocktail was apparently meant to be. Having the bottles nestled together did not strike quite the chord until my decision to freeze a handful of raspberries; they were at the ‘use them or lose them’ stage so I placed them individually on a plate and into the freezer they went. That’s when lightning struck. An unlikely marriage maybe, this vodka from Texas, Limoncello from Italy and raspberries from California, but all three together, right in front of me, it’s as if they were crying, ‘Pick me, choose me!’ and I didn’t forget. I first made and posted about this cocktail almost 5 years ago. Not only were the photos due for a redo but sharing it again seemed the right thing to do. My neighbor Amy and her family were coming over for dinner; I had promised a cocktail and I knew I could make one for her using this brand since it is gluten free. The cocktail is rimmed with my favorite combination of salt, sugar and citrus, and then the berries (which when frozen is cool, they break into little tiny balls) are muddled with the vodka, Limoncello di Capri, a touch of simple syrup. Sparkling soda finished it all off and I had an enthusiastic taste tester with Amy; she loved it too. True confession? I don’t test and retest cocktails; that would be a great excuse for drinking all the time and well, you can imagine, a problem too. I either like them or I don’t and run with them if I do. I loved this the first time around and yet it’s always nice to have friends enjoy them too. Amy was onboard but as it turns out a friend showed up yesterday just as I started taking photos and she was the lucky recipient of the one cocktail I had saved for that effort. I lost count of how many times she asked, ‘This is on your blog right?’ I hope she waited for the new photos; it was good before but now it looks as good as it tasted! Honestly a perfect warm weather cocktail. Since everything is ice cold that goes into the cocktail; I decided to whir the ice in my blender and make it a slushy concoction this time around. Not necessary but sure fun and you should try it too. Even though we had a bit of snow last night in Colorado; I’m ready for spring and more of these cocktails. Cheers! 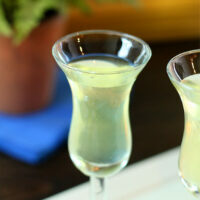 Love Limoncello? Here's some more fantastic cocktails with my favorite liqueur! 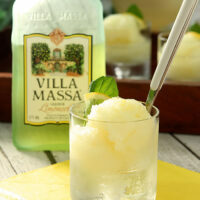 A super versatile cocktail made with a mixture of citrus and Limoncello. 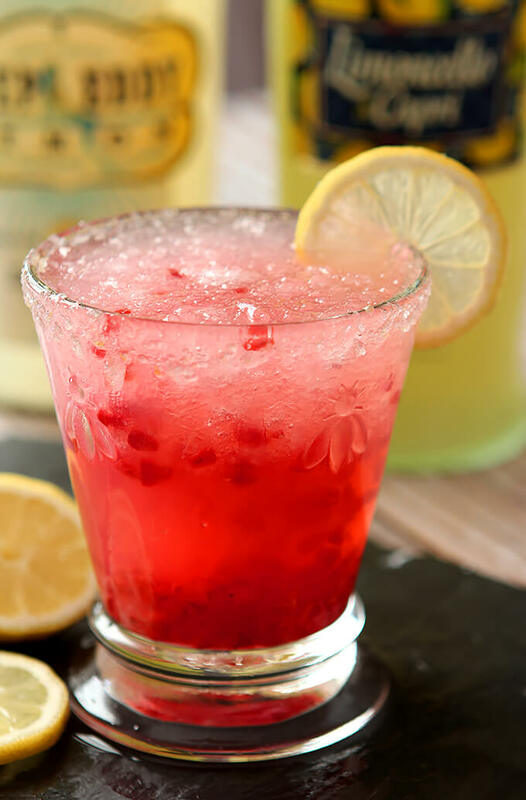 A refreshing blend of lemon vodka, Limoncello liqueur and frozen raspberries, topped with sparkling soda. Combine the sugar, salt and zest and rub together to mix well. If possible allow to dry out a bit before using. Rub the edge of a chilled glass with a slice of lemon and dip the edge into the Citrus Rimmer. 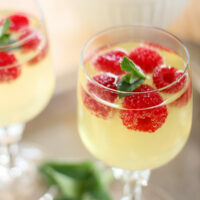 Put the frozen raspberries, limoncello and simple syrup in the glass and muddle until the raspberries fall apart. Add the vodka and stir. Fill the glass with crushed ice (optional) and top with the soda; stir. 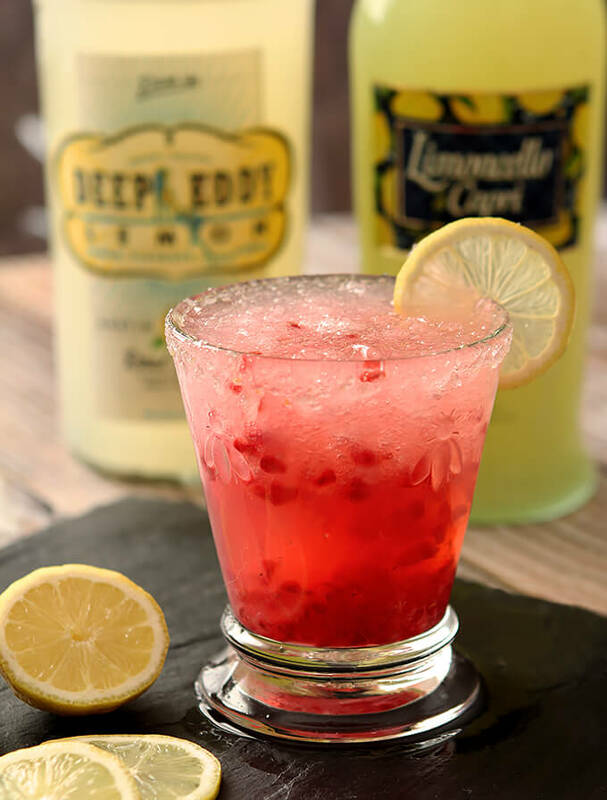 Deep Eddy Lemon Flavored Vodka is a combination of vodka, fresh lemon juice and cane sugar. If using plain vodka; simply squeeze a tsp or less of lemon juice into the glass before combining ingredients. If a sweeter cocktail is desired, add a bit more simple syrup. The nutritional information above is computer-generated and only an estimate. Please do your own research with the products you're using if you have a serious health issue or are following a specific diet. Cocktails may have ingredients measured into the nutrition calculation for simple syrups and ingredients to rim glasses that are made in volume so the calorie count will not be accurate as a result. If I make a cocktail that’s four or five years old on the blog and LOVE it…sometimes I want to report it. If I make one with photos I hate? Then it’s a given. This was both! I have occasionally used the great outdoors to keep something cold but not my vodka…what is wrong with me? Seriously I need to do that, they take up way too much room in my fridge. The beer we put outside for a Christmas party? Yeah, we should not have forgotten about it. All of my college friends are visitng this weekend. this drink is totally gonna happen! Yay! Hope you enjoy it as much as we did! We as in neighbors who see my post and then come over to help me try them out. I even ran out of berries and used some raspberry jam and it might not have been as pretty but it was equally good! This looks amazing! 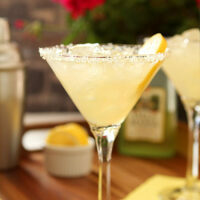 I loooove limoncello and I’m sure it makes a great addition to this pretty drink. Cheers! Where is that booze list and how can I get my name on it? 😀 Seriously though, that looks like a great summer cocktail, cheers!! I’m not a huge fan of vodka but this looks fantastic! I love raspberry cocktails! When I have someone share they are not a fan of vodka, I have to presume that they had bad vodka (those overly icky sweet types called Cake or Vanilla) or maybe they overimbibed and had a bad vodka experience? I also think most bars overdo it in the pricey cocktails they pour; for $10 they figure you want BOOZE. 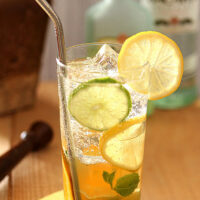 A light hand with ingredients should result in a beverage that is tasty without having a strong taste of booze. I hope you do try this; it is now a favorite concoction; so light and refreshing. What a beautiful cocktail! I may try making these by the pitcher! Just be sure you have someone there to help you drink them. Yes, they do go down THAT easily! If it could only be summer now, I’d be drinking this right this minute. I love this idea! That does look like the perfect summer cocktail, Barb! I love anything with limoncello, so I know I’d love this one. Great post!